Can you confirm these amateur observations of Apostolepis flavotorquata? Comment Synonymy that of PETERS & OREJAS-MIRANDA 1970 (who also synonymized Elapomorphus nigrolineatus PETERS 1869: 439 with A. flavotorquata; however, Ferrarezzi, in his PhD thesis  considered A. nigorlineata as a valid species). E. nigrolineatus is now considered a synonym of Apostolepis pymi by some authors). Type species: Elapomorphus flavotorquatus DUMÉRIL, BIBRON & DUMÉRIL 1854 is the type species of the genus Apostolepis COPE 1862. 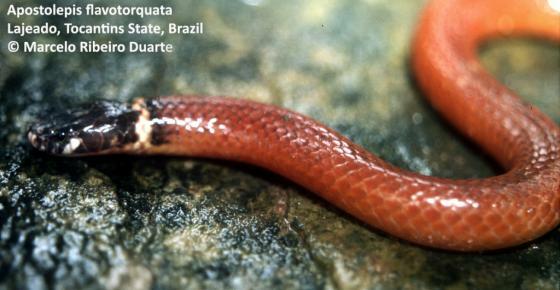 Diet (genus): Usually ophiophagous feeding on amphisbaenians, small colubrids and, perhaps, blindsnakes (Scolecophidia). Sometimes invertebrates and larvae found in the soil, earthworms.